Pollen is a fine powder that flowers produce as part of its growing process. When it is transferred from flower to flower through pollination, pollen fertilizes flowers and helps them grow seeds and fruits, vegetables, or nuts. When a honey bee lands on different flowers, she is covered in pollen, because it sticks to tiny hairs on her body. When she is completely covered in pollen, she hovers over a flower and uses special combs on her front legs to brush the pollen from her body into two pollen baskets on her back pair of legs. These baskets are like pockets made of tiny hairs. When the baskets are full, they will have bright round balls of pollen in them. She takes the pollen back to her honey bee hive where other worker bees take the balls of pollen off of her legs and pack them into cells for safe keeping. Honey bees need pollen for food because it's a good source of protein that helps with muscle and organ development. 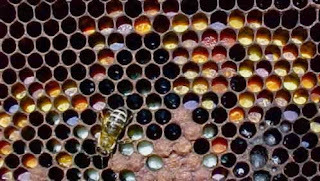 Just like we eat nuts, meat and fish, cheese and yogurt or beans and lentils for protein, bees eat pollen. Honey bees also mix the pollen with honey to create “bee bread” which is fed to the baby bees and helps them grow and gives them energy. Pollen also contains fats, vitamins, and minerals which keeps the bees healthy. 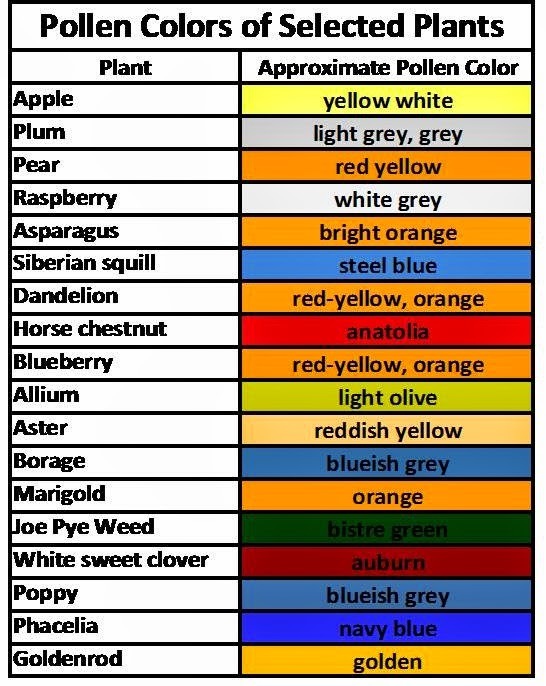 The pollen from one plant varies from another, and it comes in a rainbow of colors both bright and pale depending on the plant from which it was gathered. 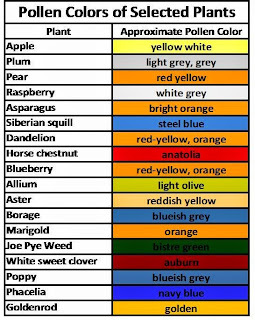 The colors of pollen include yellow, orange, green, pink, and blue. 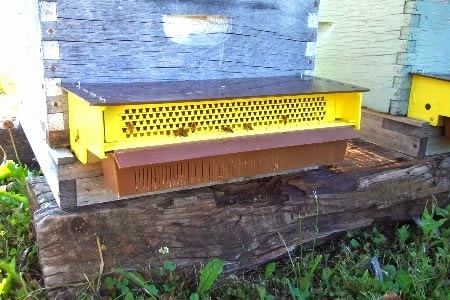 Beekeepers sometimes collect pollen from beehives by placing a pollen trap on the entrance of a hive. The pollen trap is made up of holes that the bees can easily fit through but are not quite big enough for those large balls of pollen to squeeze through. When bees crawl through holes in the pollen trap, it causes the balls of pollen to gently fall of their legs and into a tray that catches it. 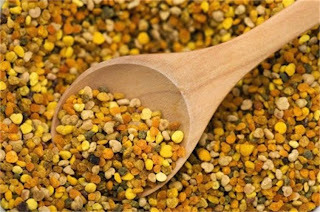 Pollen is very healthy for humans to eat because it contains many vitamins and minerals and is a rich source of protein. It is a great natural energy booster that helps keep you going all day. Bee pollen also has enzymes that aid the body’s digestive system (the breaking down of food into substances that can be used by your body). Enzymes help your body get all the nutrients you need from the food you eat. Also, pollen can boost your immune system and protect your body from disease and sickness. Lastly, pollen can be used to soothe inflamed and irritated skin and helps protect skin and build new skin cells. I’ll leave you with an amazing fact about pollen: it takes a bee working 8 hours a day for 1 month to make one teaspoon of pollen which contains over 2.5 billion grains of flower pollen in it!